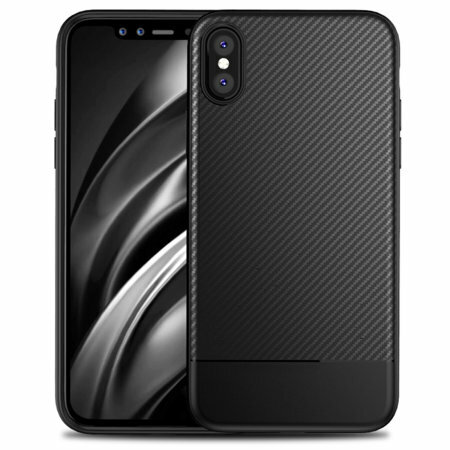 Olixar Carbon Fibre case is a perfect choice for those who need both the looks and protection! A flexible TPU material is paired with an eye-catching carbon print to make sure your Apple iPhone XS is well-protected and looks good in any situation. It's a good secure cover and seems to protect the phone well. The only thing I'd say would improve it is the friction. When it's on a smooth shiny surface it slides a bit too easily. It's definitely better value than most other covers and seems strong enough to protect the phone if it fell out of my hand or whatever, but the fact that the cover is a bit too "slippery", means there's a greater chance of it falling. The Apple cover I had previously was much too expensive, but you could have put the phone on a fairly steep slope and it would have stayed there without slipping.